Redgillite: Mineral information, data and localities. For its first noted occurrence at the Red Gill Mine (but not the type locality). The photo at right shows the mine that the mineral is named after, rather than the type locality. 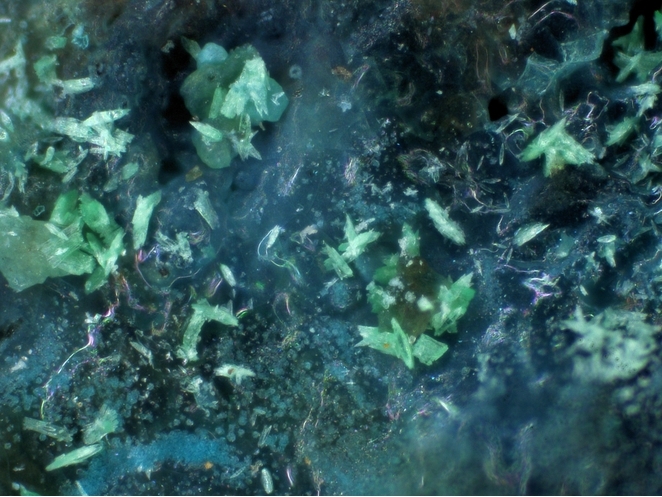 A copper sulphate visually similar to malachite. Chemically very similar to montetrisaite. bladed crystals up to 0.15 mm long with squared-off or tapering terminations; usually in radiating groups. in thin fractures in partly oxidized copper sulphides, probably dump-formed. Langite 8 photos of Redgillite associated with Langite on mindat.org. Montetrisaite 7 photos of Redgillite associated with Montetrisaite on mindat.org. Cuprite 3 photos of Redgillite associated with Cuprite on mindat.org. Schulenbergite 2 photos of Redgillite associated with Schulenbergite on mindat.org. Susannite 2 photos of Redgillite associated with Susannite on mindat.org. Hemimorphite 2 photos of Redgillite associated with Hemimorphite on mindat.org. Serpierite 1 photo of Redgillite associated with Serpierite on mindat.org. Cerussite 1 photo of Redgillite associated with Cerussite on mindat.org. Brochantite 1 photo of Redgillite associated with Brochantite on mindat.org. Posnjakite 1 photo of Redgillite associated with Posnjakite on mindat.org. Cooper, M.P., Stanley, C.J. (1990) Minerals of the English Lake District - Caldbeck Fells. NHM Publications: 1990: 133. Pluth, J.J., Steele, I.M. (2002) IMA 18th General Meeting, Poster Session A12, A12-4. Pluth, J.J., Steele, I.M., Kampf, A.R., Green, D.I. (2005) Redgillite, Cu6(OH)10(SO4)·H2O, a new mineral from Caldbeck Fells, Cumbria, England, UK: Description and crystal structure. Mineralogical Magazine: 69: 973-980. Schnorrer, G., Pfeiffer, F., Schwarz, L. (2006) Redgillit – ein neues Cu-Sulfatmineral von zehn Fundstellen aus Deutschland. Aufschluss: 57: 15-22 (in German). The following Redgillite specimens are currently listed for sale on minfind.com. Kolitsch, U. & Brandstätter, F. (2011): 1685) Aurichalcit, Brochantit, Calcit, Covellin, Gips, Magnetit, Montetrisait, Redgillit und Smithsonit von der Putzkammeralpe im Rindertal (Gaflunatal), Montafon. P. 152-153 in Niedermayr, G. et al. (2011): Neue Mineralfunde aus Österreich LX. Carinthia II, 201./121., 135-186. Heinrich, M., Reinhardt, M. (2017): Virneberg, Rheinbreibach, Siebengebirge, Germania. I minerali delle scorie. Micro, 15, 2-2017, 104-107. Pluth, J. J., Steele, I. M., Kampf, A. R. & Green, D. I. (2005): Redgillite, Cu6(OH)10(SO4)•H2O, a new mineral from Caldbeck Fells, Cumbria, England: description and crystal structure. Mineralogical Magazine, 69, 973-980. Moreton, S. & Green, D.I. (2007) “The mineralogy of the Wicklow lead mines”, Journal of the Mining Heritage Trust of Ireland, No. 7, p.19-32. Betterton, J. 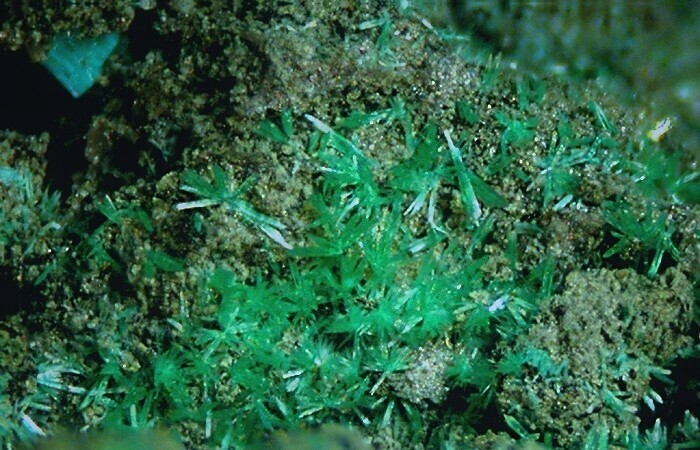 (2000) Famous Mineral Localities: Penberthy Croft Mine, St. Hilary, Cornwall, England. UK Journal of Mines & Minerals, 20, 7-37. Pluth, J.J., Steele, I.M., Kampf, A.R., Green, D.I. 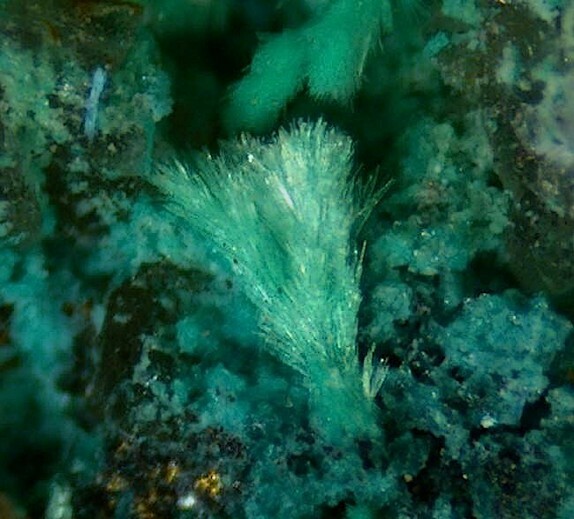 (2005) Redgillite, Cu₆(OH)₁₀(SO₄ )•H₂O, a new mineral from Caldbeck Fells, Cumbria, England: description and crystal structure. Mineralogical Magazine, 69:6, 973-980.
Cooper, M.P. and Stanley, C.J. (1990) Minerals of the English Lake District: Caldbeck Fells. Natural History Museum Publications, London, 160 pp. ; Pluth, J.J., Steele, I.M., Kampf, A.R., and Green, D.I. (2005) Redgillite, Cu6(OH)10(SO4)·H2O, a new mineral from Caldbeck Fells, Cumbria, England, UK: Description and crystal structure. Mineralogical Magazine, 69, 973-980.; Bridges, T.F., Green, D.I., Rumsey, M.S., and Leppington, C.M. 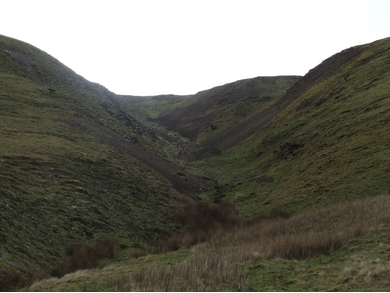 (2008) A review of the mineralisation at Red Gill Mine, Caldbeck Fells, Cumbria, England. Journal of the Russell Society, 11, 29-47.
Cooper, M.P. and Stanley, C.J. (1990) Minerals of the English Lake District: Caldbeck Fells. Natural History Museum Publications, London, 160 pp. ; Pluth, J.J., Steele, I.M., Kampf, A.R., Green, D.I. (2005) Redgillite, Cu6(OH)10(SO4)·H2O, a new mineral from Caldbeck Fells, Cumbria, England, UK: Description and crystal structure. Mineralogical Magazine, 69, 973-980.; Green, D.I., Bridges, T.F., Rumsey, M.S., Leppington, C.M., and Tindle, A.G. (2008) A review of the mineralogy of the Roughton Gill Mines, Caldbeck Fells, Cumbria: Part 2 The Roughton Gill South Vein on Balliway Rigg. Journal of The Russell Society, 11, 3-28. S. Rust collection; Pluth, J. J., Steele, I. M., Kampf, A. R. & Green, D. I. (2005): Redgillite, Cu6(OH)10(SO4)•H2O, a new mineral from Caldbeck Fells, Cumbria, England: description and crystal structure. Mineralogical Magazine, 69, 973-980. S Rust collection, Nat Hist Museum London; Pluth, J. J., Steele, I. M., Kampf, A. R. & Green, D. I. (2005): Redgillite, Cu6(OH)10(SO4)•H2O, a new mineral from Caldbeck Fells, Cumbria, England: description and crystal structure. Mineralogical Magazine, 69, 973-980. UKJMM 17 unknown F2; Pluth, J. J., Steele, I. M., Kampf, A. R. & Green, D. I. (2005): Redgillite, Cu6(OH)10(SO4)•H2O, a new mineral from Caldbeck Fells, Cumbria, England: description and crystal structure. Mineralogical Magazine, 69, 973-980.